Sign up for Broadjam today to follow My Mourning Belle, and be notified when they upload new stuff or update their news! Released June 2008. 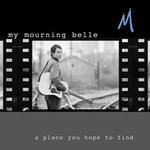 "A Place You Hope to Find" is the debut EP from My Mourning Belle. Julie Lawrence of OnMilwaukee.com describes the album as "personal, intimate and strong -- a moving collection of songs." Includes the tracks: 1) Start Again 2) Lorelei 3) Tragedy Reigns 4) When You're Gone 5) Shedding Skin Album Credits: All music and lyrics written by Mark Allen. Produced by Medavon with Mark Allen. Engineered, mixed and mastered by Medavon. Vocals, acoustic guitars, synth and piano by Mark Allen. Guitars, bass, synth and drum programming by Medavon. Photography by Eric Dorgan and Andy Kallies. Design by Michele Eschenbacher.